Hensley Hall won the residence hall Eco-Challenge this year. Officials have not announced any other data from this semester’s contest. Updated: April 28, 2016 at 6:26 p.m.
GW’s residence halls performed better in this year’s sustainability challenge than they had in the last two years. Hensley Hall won the eco-challenge – a contest that pits halls against one another to conserve electricity and water and to recycle well. Officials said the amount of energy students saved could power four residence halls for an academic year. Director of the Office of Sustainability Meghan Chapple said in an email that the buildings that participated this year collectively reduced electricity use by 5.7 percent and water use by 24 percent from last year. The energy savings would be enough to power Merriweather, Clark, Hensley and Cole halls for a whole school year. “It’s as though we took them off the grid,” Chapple said. The eco-challenge is an opt-in competition, and few residence halls chose to compete. Out of the 43 residence halls and townhouses on campus, 16 buildings opted into the contest – a total of 2,789 students. Only one student from each residence hall needs to enter for the entire building to be considered in the contest. In 2013, residents of the winning hall reduced their electricity usage by 52 percent and their water consumption by 38 percent. This is the third year officials have not released data on individual halls. Chapple said the organizers of this year’s challenge focused on student engagement by hosting events like waste and recycling sorting, and by designing a March Madness-style bracket for participating halls. “It gave them a specific hall to compete against, which fostered friendly competition,” Chapple said in an email. Chapple announced Hensley Hall’s win at the Earth Day fair last Tuesday, but did not announce any data from this semester’s contest. Last year, the University would not release the fall 2015 contest results after the majority of residence halls failed the challenge the year before. In the past, prize options included a truck-load of toilet paper, but less wasteful options were given to the winner this year. Hensley Hall’s prize is an afternoon visit with puppies during exam week. 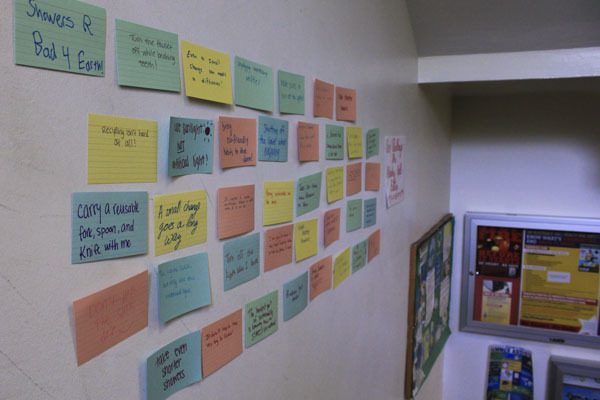 Hensley Hall council president David White said that representatives from the sustainability office did not check in or report progress outside of three long-term checkpoints, but said residents were committed to the contest. Ryan Ihrke, the director of sustainability at Green Mountain College in Vermont, said there are often difficulties in involving students in conservation without consistent feedback. Ihrke added that while increasing student involvement is always difficult, students find more motivation through shorter competitions that provide educational opportunity and daily feedback. This article appeared in the April 28, 2016 issue of the Hatchet.